With a Foreword by John Hattie internationally recognized scholar and author of Visible Learning, educators Brent Duckor and Carrie Holmberg invite you on the journey to becoming a formative assessor by encouraging you to focus on seven research-based, high-leverage formative assessment moves: priming, posing, pausing, probing, bouncing, tagging, and binning. As teachers use these moves to develop formative assessment skills, they learn how to uncover students’ misconceptions—as well as their own sense of deeper learning in the classroom. Each chapter explores a classroom-tested move, including foundational research, explaining how and when to best use it, and describing what it looks like in practice. Highlights include case studies, try-now tasks, and tips and advice from beginning and seasoned teachers who use these formative assessment moves in their classrooms. This book has been endorsed by leading scholars and researchers in educational assessment including Professors Jim Popham, Lorrie Shepard, Gene Glass, David Berliner, Lee Shulman and P. David Pearson. Duckor, B., & Holmberg, C. (2017). Mastering Formative Assessment Moves: 7 High-leverage Practices to Advance Student Learning. Alexandria, VA: ASCD. Why is the teacher asking “Why?” so much? Why is the teacher not calling on Mary and John, who have their hands up? And why is the teacher putting all answers on the white board, even the wrong ones? Students may struggle with such questions if they’re unfamiliar with assessment practices that seek to promote student learning, rather than those that merely focus on evaluating achievement. 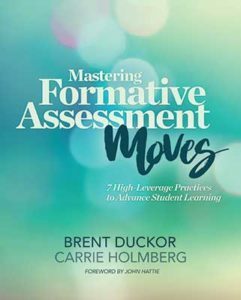 This article looks at seven moves teachers can make to improve their formative assessment techniques and become better, more responsive formative assessors in the process. These include priming students first, posing good questions, pausing during questioning, probing student responses, bouncing questions through the classroom, using tagging to generate a wide range of responses, and using binning strategies to make sense of their students’ learning progressions. Duckor, B. (2014). Formative assessment in seven good moves. Educational Leadership, 71(6), 28-32. What is formative assessment, or as we refer to it, doing FA? Giving quizzes? Managing interim test data? Processing exit slips? It turns out that doing formative assessment in mathematics classes depends greatly on teachers’ and students’ use of language–producing language, taking language in, and sharpening language skills. Research on teacher professional learning has shown that formative assessment can improve student learning more than most instructional practices (Hattie 2012). Empirical evidence indicates that thoughtfully implemented formative assessment practices improve students’ learning, increase students’ scores, and narrow achievement gaps between low-achieving students and others (Black and Wiliam 1998). Given the role that students’ achievement in middle school mathematics classes can play in college-going trajectories (Balfanz 2009), articulating how formative assessment can support equity in mathematics classrooms is critically important. Some conceptualizations of formative assessment are more explicit than others in their focus on language use (Hakuta, 2013). In this article we present our conceptualization of formative assessment with the FA Wheel, introduce the FA moves—priming, posing, pausing, probing, bouncing, tagging, and binning—and illustrate the moves at play in one middle school mathematics class. Each of these moves lend themselves to sustaining focus on the development of academic language for all students, which is critical to fostering equity in mathematics learning and teaching. Duckor, B., Holmberg, C., & Rossi Becker, J. (2017). 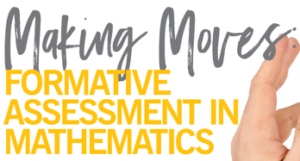 Making moves: Formative assessment in mathematics. Mathematics Teaching in the Middle School, 22(6) 334-342. Using the framework of instructional moves that can also serve as assessment strategies, this piece cites numerous examples of teachers reflecting over a two-year period on their teaching practice to explore the applicability of Joseph Harris’s meta-language for revision, to the supervision of beginning teachers and the nurturing of reflective practice in experienced teachers. The intersection of formative assessment moves with Harris’s work is considered as are the implications for ELA teachers seeking and modeling feedback on their content. Lovell, J., Duckor, B., & Holmberg, C. (2015). Rewriting teaching practices in our own voice: When lessons become texts and texts become lessons. English Journal, 104(6), 56-60. Focusing on Moves-based Formative Assessment to Increase Equity of Voice in Middle School Mathematics: A Case for Video-based Professional Development. This chapter presents a qualitative case study of middle school mathematics teachers engaged in a school-based professional development module focused on formative assessment. The collaborative lesson study employed a moves-based approach, highlighting the role of instructional practices such as priming, posing, pausing, probing, bouncing, tagging, and binning (Duckor, 2014) that provide windows into students’ mathematical thinking. The moves-based formative assessment framework facilitated teachers’ attention to feedback loops in classroom talk, while promoting instructional spaces for students to use academic language to reason mathematically based on common assessments and NCTM Standards. Findings indicate the middle school teachers’ use of video stimulated recall involving their classroom instructional practices and facilitation from university coaches enhanced participants’ reflective practice. This form of peer-to-peer instructional coaching, centered on formative assessment driven lesson study, supports deeper understanding for teaching mathematics in diverse middle school settings. Duckor, B., Holmberg, C., & Rossi Becker, B. (in press). Focusing on Moves-based Formative Assessment to Increase Equity of Voice in Middle School Mathematics: A Case for Video-based Professional Development. In S. B. Martens & M. M. Caskey (Series Ed. ), The Handbook of Research in Middle Level Education: Preparing middle level educators for 21st century schools: Enduring beliefs, changing times, evolving practices. Washington, DC: AERA Press. This 60-minute webinar explores foundational research for each move, explaining how and when to best use it during instruction and describing what it looks like in practice with concrete examples from pre-service and in-service professional learning settings. Note: You do not have to be an ASCD member to watch this archived presentation, but you do have to register to view it. It is free of charge.